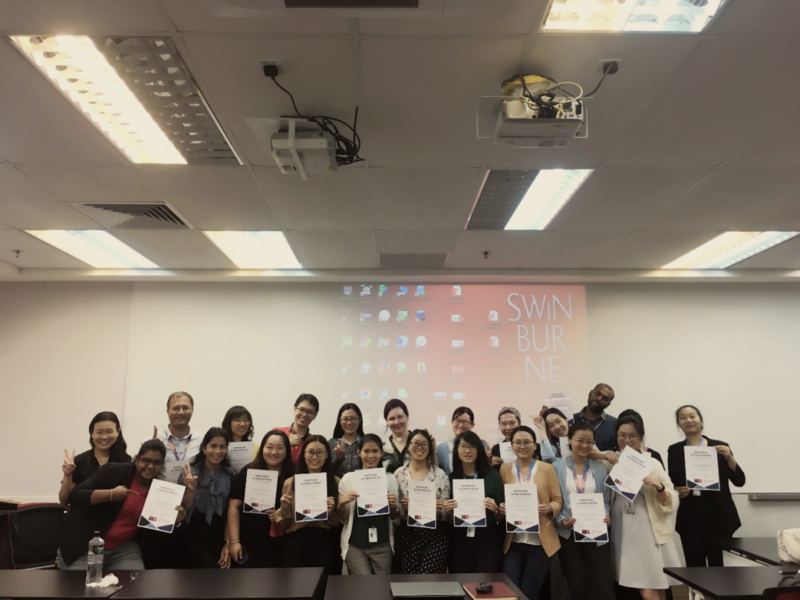 On August 3rd, the third group of the teaching backbones from AEMG finished the three weeks’ teaching ability training at Swinburne University of Technology Sarawak Campus successfully. 16 teaching backbones from all branches have joined the training. During the training period, the three-week course was divided into three levels. The first level was knowledge-input. Instructor Hugh and other visiting teachers provided trainees with a variety of teaching-related knowledge from all angles. The second part was the trainees’ reflection. The trainees sorted out their own teaching process, asked questions, and studied the problems in the form of report to solve problems. The last step was the feedback display. The trainees would share their questions with other students. During the training, under the instruction of Hugh Kuan, all participants not only studied varieties of teaching theories hardly, but also did research about how to solve all kinds of problems occurred in their teaching and teaching management. During the last week, all participants prepared micro-teaching with applying the theories learnt in the first two weeks to the practical class and presented the micro-teaching one by one. Besides, everyone finished the action research reports and presentation based on their practical teaching and research. Through the three weeks training, the teaching backbones from different branches greatly improved their understanding of teaching theories and teaching abilities, they also broadened horizons and strengthened the teamwork spirit through appreciating the local conditions and customs in the spare time. The hard working and team spirits were completely fulfilled during the training. Finally, everyone got certificate from Swinburne University of Technology and AEMG. The training was successfully finished!